You are invited to our WLS Alumni Annual Meeting on Monday, Sept 17, at 10:30 a.m. just before the symposium. WLS Alumni includes not only all WLS graduates, but also all WELS pastors listed in the Synod yearbook. In addition to the business of the alumni meeting—reports and elections—Pastor Jonathan Bare will discuss the expansion of the Pastoral Studies Institute as our seminary responds to the growing number of requests for pastoral training here in the U.S. and around the world. For lunch, here are some nearby restaurants. The symposium will follow at 1 p.m. in the auditorium. 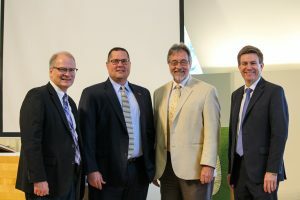 Wisconsin Lutheran Seminary Alumni seeks to further the bonds of friendship among its members and to encourage support of the mission of Wisconsin Lutheran Seminary. The seminary is a special place with a special purpose. By God’s grace, your alma mater continues its commitment to God’s Word and the Lutheran Confessions. We train men to serve as pastors and missionaries, proclaiming Christ’s love to a dying world. Your ministry is part of the living legacy of the confessional theological training you received at the seminary. As part of this legacy, we invite you to help lay a foundation for future generations of pastors. Three WLS Alumni funds exist to support the mission of the seminary. Each year, the alumni awards scholarships to current students, supporting the next generation of those who will preach the gospel to a hurting world. The alumni also supports current pastors through Grow in Grace, the seminary’s institute for pastoral growth. The fund especially aims to decrease costs for celebration of ministry retreats. These retreats are held at the three, ten, 25, and 35-year mark of ministry and are designed to refresh and renew pastors and their wives. The goal of the Khruxate Endowment Fund is “to leave a legacy for the messengers of tomorrow.” This permanently-endowed fund of WELS Alumni will provide interest income for the continuing support of projects and scholarships as designated by the WLS Alumni. • Efforts to grow the fund will be managed by the WLS Alumni Investment and Grants Committee. • Gifts to the fund will remain intact—only interest income will be dispersed. • No disbursements of interest income will be made until the fund reaches a value of $50,000. • WLS Alumni are urged to consider planned giving as a means to support the fund.